Kirk West logged a lot of miles with the Allman Brothers Band and had a camera with him plenty of the time he spent with the band. The former road manager has distilled his massive collection of photos down to 350 that he feels tell the story of the iconic Southern Rock band best. 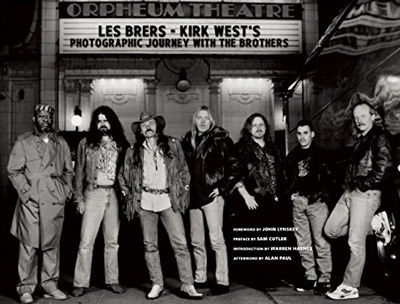 They are featured and captioned by West in a large format book titled Les Brers: Kirk West's Photographic Journey with the Brothers. Spanning the period between the release of Brothers and Sisters (1973) all the way through the group's final run as a touring band at the Beacon Theatre in 2014, the book includes a lot of photos never before published. The photos and Kirk's personal insights about the moments they were taken are supplemented with written reflections on the band by late era ABB member Warren Haynes, noted Rock author Alan Paul, who wrote One Way Out: The Inside History of the Allman Brothers Band, Sam Cutler, who served in West's role during stints with Tthe Rolling Stones and Grateful Dead, and John Lynskey, editor and publisher of ABB fan mag Hittin' The Note.